The Finnish star is most likely the coolest guy in Formula 1… ever. There is nothing that really makes him upset, angry or happy for more than for fifteen minutes or so. Kimi is quick to put everything behind him. The cool nature is innate. “The doctor started to think that Kimi perhaps had a concentration problem,” Paula explains, “but it was only a question of the toys! “He is always going his own way. Whatever you do, you cannot change his mind if he has decided something. As a small kid, if I wanted him to help me in some household chores – let’s say like taking a trash can out – if I saw he didn’t want to do it, it had to ask in an opposite way. I’d say to him: “Don’t you take the trash can out; I will do it myself.” Usually that way Kimi did it,” his mother recalls. “The closest people – like parents – never see those kind of things themselves,” says Paula. “I think we noticed some promising signs for the first time when Kimi was about ten years old and started in the junior classes of go-karts in Finland. It’s was a father of one the competitors – who had a lot of experience as a mechanic for his own son – who started to ask; “who’s that boy in car number 104?” [which was Kimi]. He said that with that attitude and that speed he would go far; and he was right,” Paula smiles. “It was a surprise. His friends had been saying to me that Kimi was so tired and finished with Formula 1 and then suddenly he went back. I think it was very good for him to have his break as he seems to really be enjoying racing again,” she emphasizes. “The boys are in a way like I was with Kimi; competing with each other in every possible way. Kimi likes to keep them well equipped with all kind of racing stuff for kids. This Christmas he bought them tablets; or should I say Santa Claus brought tablets for them,” Rami reveals. Toni Vilander has been very close friend of Kimi since they started to race together as 10-year-olds and were also in the army together. “As we race in different places we have not been seeing each other very often, but I think the friendship is forever,” he says. “I was more surprised about Kimi making a comeback than how he performed during the season,” says Toni. “When he stopped, he was so fed up with Formula 1 and kept saying “never again”. I think it’s a good thing to have some distance away from everything and do something totally different, like rallying. That’s how your way of thinking changes and your approach gets stronger and stronger. Kimi’s image as a laid back person was seen even more in his first season as a Lotus F1 Team driver. His physio, Mark Arnall, has been working with Kimi since 2001 and asserts that the laid back image gives a wrong impression of how hard the Finnish star trains. Kimi even ensures that his trainer stays in top condition. “He gave me the latest heart rate monitor from the Finnish company Suunto for Christmas,” says Mark. One long-time trusted friend has a big input into how Kimi looks on track. Uffe Tägtström – one of the leading helmet designers of the racing world – has been designing Kimi’s helmets since his karting days. “Artistic? I would not say he is very artistic, but he knows, what he wants and he is very fashion-conscious. He is certainly of his generation,” Uffe says. “Usually Kimi gives a hint of what should be on his helmet for the season ahead,” says Uffe. “I’ll then make five different versions of the idea with the computer and he picks what he likes the most. “Last year he wanted to have his race number up there. He had the number previously during the McLaren times, but then it was at the back of the helmet. Now the number will change from 9 to 7, but there won’t be that much of change for 2013, just some new partners,” Uffe explains. “The idea was there for many years, but with McLaren and Ferrari, there was no opportunity to use it. Last year it was perfect and the feedback was great too,” Uffe praises. 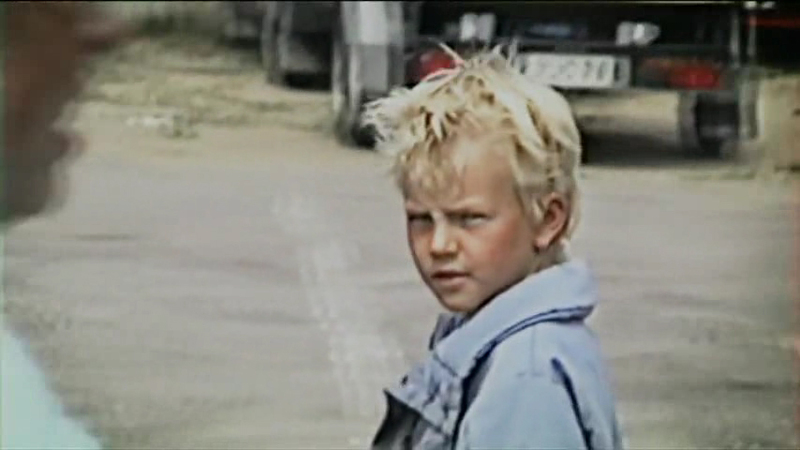 On this little boy´s face has written, when I want, I gonna be World Champion….. once…,twice……….Go, Kimi, go! What do you mean birth sign? Libra (astrology) is my guess. I’m libra myself.